Get ready to step inside the world's most popular real estate board game with the opportunity to become the next tycoon in Super Monopoly Money slot machine from WMS and available for free play here at Slotorama! Get ready to step inside the world’s most popular real estate board game with the opportunity to become the next tycoon in Super Monopoly Money slot machine from WMS and available for free play here at Slotorama! The awesome game has a payout of 95.97% for its 5-reels and boasts features like wild substitutes, scatters and the exciting Wheel Bonus! Do you want to Pass Go and Collect $200? Well the opportunities are there for a LOT more than that in this fun game. Make winning combinations with familiar symbols from the board game including the car, boot, ship and top hat icons. 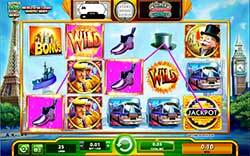 You’ll also find symbols including the Free Parking symbol, jackpot, wild, wild bonus, Mr. Monopoly, a gentleman, the dog, a bucket of cash and much more. Free Parking Feature – The Free Parking Feature may be triggered when 1 or more FREE PARKING appears on the reels and can either create a win, trigger the Free Spin Bonus, or possibly increase existing wins. Pick 1 of 5 FREE PARKING to reveal a symbol. All FREE PARKING will be replaced with the selected symbol, before the evaluation. The Free Parking pick will always contain a WILD and MM BONUS, plus the 3 symbols that have landed on reel 1. Free Spins Bonus – Land 3 or more BONUS and/or MM BONUS appearing left to right on adjacent reels, beginning with the leftmost reel on any active paylines trigger the Free Spin Bonus. Earn 15, 10, or 8 free spins are awarded for 5, 4, or 3 BONUS and/or MM BONUS, respectively, per triggering line combination. Monopoly Money – When MM WILD appears anywhere on reel 5, it will expand to fill the reel and is wild for all symbols except FREE PARKING. Wheel Bonus – Click WHEEL BONUS to start the Wheel Bonus. Spin the wheel by clicking on Mr. Monopoly to start the wheel spin. The multiplier or Feature the on-screen arrow points to after the wheel stops is awarded. You can win multipliers ranging from 1x to 100x, a Go! Re-spin, a Chance feature, or Community Chest Feature! Monopoly Money House / Hotel Awards – AHouse or Hotel prize may be awarded after any wagered spin where Monopoly Money is not awarded. Monopoly Money Houses and Hotels are awarded in Monopoly Money only. The chance of winning a Monopoly Money House or Hotel increases with the amount wagered per spin. Monopoly Money House and Hotel prizes are awarded randomly from individual ranges, both displayed within the in-game help pages.